Sir Arthur John Evans (July 8, 1851 – July 11, 1941) was a British archaeologist, who received a knighthood for his work advancing the knowledge of the Bronze Age in the Mediterranean area. He primarily worked on the island of Crete, uncovering ruins and numerous artifacts and artworks from, what he named after the legendary King Minos, the Minoan Civilization. Among his findings he discovered writings in previously unknown scripts, which he called Linear A and Linear B.
Evans purchased land on Crete that contained the ruins of Knossos, which he excavated and then reconstructed (to the condemnation of purists), producing a museum of Minoan culture, allowing visitors to have an experience of life in ancient times. Arthur John Evans was born in Nash Mills, England. He was the eldest son of Sir John Evans, a paper manufacturer and amateur archaeologist of Welsh descent, who evoked in his son a great interest for archaeology. Evans was educated at Harrow School, at Brasenose College, Oxford, and at the University of Göttingen, where he obtained a degree in history. In 1878, he married Margaret Freeman, who became his companion and partner in his work until her death in 1893. After graduation, Evans traveled to Bosnia and Macedonia to study ancient Roman sites. At the same time, he was working as a correspondent for the Manchester Guardian in the Balkans and secretary of the British Fund for Balkan Refugees. However, due to his critical attitude toward local government he made many enemies. In 1882, he was accused of being a spy, arrested, and expelled from the country. In 1884, he became curator of the Ashmolean Museum in Oxford, a position he held until 1908, when he was made professor of prehistoric archaeology. In 1901, he became a fellow of the Royal Society, and in 1911 he received a knighthood. He served as president of the Society of Antiquities from 1914 to 1919, and president of the British Association from 1916 to 1919. Evans is most famous for his archeological excavations on the island of Crete. He visited Crete for the first time in 1894, where an unknown script on seal stones was found together with various unidentified coins. After he studied the sites, he proposed that the pre-classical Mycenaean civilization of Greece originated in Crete. He published his ideas in Cretan Pictographs and Pre-Phoenician Script in 1895. Four years later, for the purpose of excavation, he purchased the site of Knossos, which became a treasure trove of finds. There, Evans uncovered the ruins of a palace, the restoration of which he worked on for the rest of his life. Following the Greek legend of the Cretan King Minos and the beast called Minotaur, Evans coined the name "Minoan" and gave it to this newly found civilization. By 1903, most of the palace was excavated, revealing the beauty of Minoan artwork, through the hundreds of artifacts and writings that he found. Evans described this work in his four volumes of The Palace of Minos at Knossos, which he published from 1921 to 1935. Evans continued his excavations until he was 84 years old. He died in a small town of Youlbury near Oxford in 1941. Evans' interest in the island of Crete, which according to the Greek legend hosted an ancient civilization of "Minoans," was sparked by Heinrich Schliemann’s discovery of legendary Troy. Like Schliemann, Evans was an amateur archaeologist, driven by his passion for mythology of the ancient world. Evans, however, maintained an irrationally obstinate Creto-centrism, which led to unfriendly debate between himself and the mainland archaeologists Carl Blegen and Alan Wace. 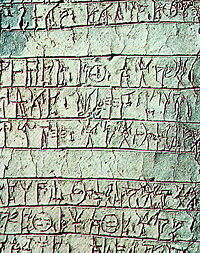 He disputed Blegen's speculation that his writings found at Pylos of Linear B (the same script Evans found on Crete) were a form of archaic Greek. Evans' insistence upon a single timeline for Bronze Age Greek civilization, based upon his dating of Knossos and other Minoan palaces, ran contrary to Wace's dating of Mycenae, which saw its heyday in the midst of Knossos' decline. Evans generated strange and convoluted explanations for these findings, and used his influence to have Wace removed from his tenured position at the British School of Archaeology in Athens. Evans believed that King Minos, described in some of the Greek stories, was real, and that Crete was the home of a once great civilization. This conviction led him to invest all his inheritance, purchasing a large piece of land that included the ruins of the palace of Knossos. After unearthing the remains of the city and its palace, including the structure of a labyrinth, Evans was convinced that he had finally found the Kingdom of Minos and its legendary half-bull, half-man Minotaur. He published an account of his findings in four volumes The Palace of Minos at Knossos (1921–1935), a classic of archaeology. However, he also substantially restored and partially reconstructed these remains, using foreign materials such as concrete. While many of his contemporaries were interested in removing items of interest from the sites they uncovered, Evans turned Knossos into a museum where Minoan civilization could become tangible, as he was more interested in building a whole vision of the past than simply displaying its riches. Thus, his reconstructions help the average visitor "read" the site, allowing them to appreciate and enjoy the beauty of the culture he uncovered. On Crete, Evans discovered writings in an unknown script. Though deciphering and translating the scripts found on the site always eluded him, Evans recognized that they were in two scripts, which he dubbed Linear A and Linear B. He—correctly, as it turned out—suggested that Linear B was written in a language that used inflection. Linear B was deciphered in the 1950s by Michael Ventris, and found to be an ancient form of Greek. Linear A remains an undeciphered script. Its decipherment is one of the "Holy Grails" of ancient scripts. Arthur Evans is one of the most well-known archaeologists in history. He was knighted in 1911 for his services to archaeology, and is commemorated both at Knossos and at the Ashmolean Museum in Oxford University. The timeline of Minoan civilization, which he constructed, although slightly revised and updated, is still considered reasonably accurate. The excavation at the site of Knossos has been continued by the British School of Archaeology in Athens. Evans used contemporary material to reconstruct the old ruins of Knossos, according to the way he thought the original structures would have looked. This drew serious criticism from contemporary scholars, but Evans was not deterred. He rebuilt what looked like a labyrinth, and built numerous new structures on the old ones, following his own vision of Minoan architecture. In this way, he blended old and new constructions, such that only a trained eye could see the difference. This practice is strongly condemned by modern archaeologists, although tourists visiting the site enjoy walking through the reconstructions experiencing life at the time of the Minoan civilization, as Evans intended. Evans, Arthur J. 1883. "Review of Schliemann’s Troja." Academy 24:437–39. Evans, Arthur J. 1889. "Stonehenge." Archaeological Review 2:312–30. Evans, Arthur J. 1896. "Pillar and Tree-Worship in Mycenaean Greece." Proceedings of the British Association (Liverpool) 934. Evans, Arthur J. 1905. "Prehistoric Tombs of Knossos." Archaeologia 59:391–562. Evans, Arthur J. 1915. "Cretan Analogies for the Origin Alphabet." Proceedings of the British Association (Manchester) 667. Evans, Arthur J. 1919. "The Palace of Minos and the Prehistoric Civilization of Crete." Proceedings of the British Association (Bournenouth) 416–17. Evans, Arthur J. 1921–1935. The Palace of Minos at Knossos, 4 vols. London: Macmillan. Evans, Arthur J. 1925. "The 'Ring of Nestor': A Glimpse into the Minoan After-World." Journal of Hellenic Studies 45:1–75. Evans, Arthur J. 1929. The Shaft-Graves and Bee-Hive Tombs of Mycenae and Their Inter-relations. London: Macmillan. Evans, Arthur J. 1938. An Illustrative Selections of Greek and Greco-Roman Gems. Oxford University Press. Sir Arthur Evans and the Excavation of the Palace at Knossos – Article from Athena Review in 2003. This page was last modified on 23 November 2016, at 20:10.